Very little is known about this very generous lady. What is known? We have compiled what we do know about Louisa DaCosta. And what stands out is that she was a quiet person who worked in the background. And maybe this is how she would prefer her epitaph to be told – without pretention or fanfare. In the mid 1990’s a book was published about a major benefactor of St Peters College and the Anglican Church in Adelaide – Benjamin DaCosta. Included in Benjamin DaCosta’s legacy was a large parcel of land in North Adelaide on which the Anglican Cathedral now stands. In his will Benjamin DaCosta left this part of his estate to the Archbishop of Adelaide. Over many years there has been a dispute as to whether Benjamin had intended to leave this part of his estate to the Anglican or Catholic Church. The Anglican Church built a beautiful Cathedral on this land and in the 20th Century it was far too late for any other religion to claim ownership. But the DaCosta name did have a Spanish connotation and the idea that Benjamin DaCosta may have been a Catholic and that the land was intended to be left to the Catholic Church persisted. A purpose of this book about Benjamin DaCosta was to trace his lineage. And dispel or otherwise once and forever whether the Anglican Church were entitled to this land or not. Benjamin was Louisa’s brother and what is known about Louisa is drawn from this book. And it is also clear that the story of Louisa DaCosta is very much entwined with her brother Benjamin, for they remained very close during their lives working together in philanthropy. Their father was Benjamin DaCosta and his second marriage was to Louisa Naylor, their mother in 1802. They had 2 children Benjamin and Louisa. Their father was Jewish and despite this Jewish lineage both Louisa and her brother Benjamin were brought up as members of the Church of England. It seems the land in Adelaide was left to the correct Archbishop of Adelaide. Louisa and Benjamin arrived in Adelaide aboard the Fairlie in 1840 from England. They stayed in Adelaide for only 7 years and they both returned to the UK, where they lived the rest of their lives. Louisa lived for 91 years. Louisa remained very close to her brother both in the UK where they spent most of their lives and for the short time they were in Australia, until Benjamin died in 1868. Louisa lived for a further 31 years. She was a spinster, and towards the end of her life a lonely woman who was also going blind. Her last years were sad ones. Louisa left Australia in 1848 but for the rest of her life she continued to give away, in today’s money, around $250,000 annually, to people and institutions including from South Australia. A search of the SA Museum brought up the following photograph. And is an example of Louisa DaCosta’s philanthropy and just how far and wide her assistance spread. Palmerston is just south of Darwin and in 1878 NT was a part of South Australia. The newly constructed Palmerston Hospital, showing the ward built with a donation from Adelaide philanthropist Louisa Da Costa. Foelsche photographed the hospital during September 1878, on her behalf, using a specially constructed platform for his tripod. The missing ketch Cavalier has turned up safely at Adelaide. Inquests were opened to-day on the bodies of James Sinclair and Arthur Pilsborough, boilermakers, who lost their lives through the bursting of a boiler-tube on the steamer Wendouree. Sinclair being scalded, to death and Pilsborough so badly injured that he has since died. No Important evidence, however, was tendered. 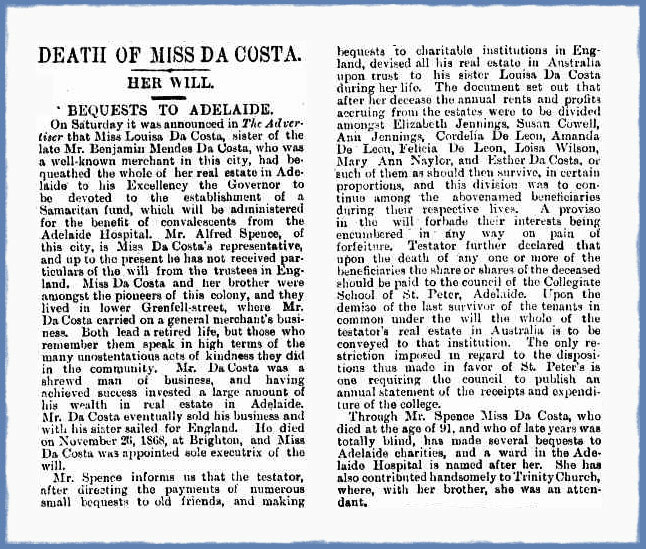 Miss Louisa da Costa, an absentee, has donated £250 to the charitable institutions of Adelaide, and £30 annually to the Blind and Deaf and Dumb Asylum. His’ Excellency the Governor has appointed his son, Mr. Noll Edward Buxton, as one of his aides-dé-camp. 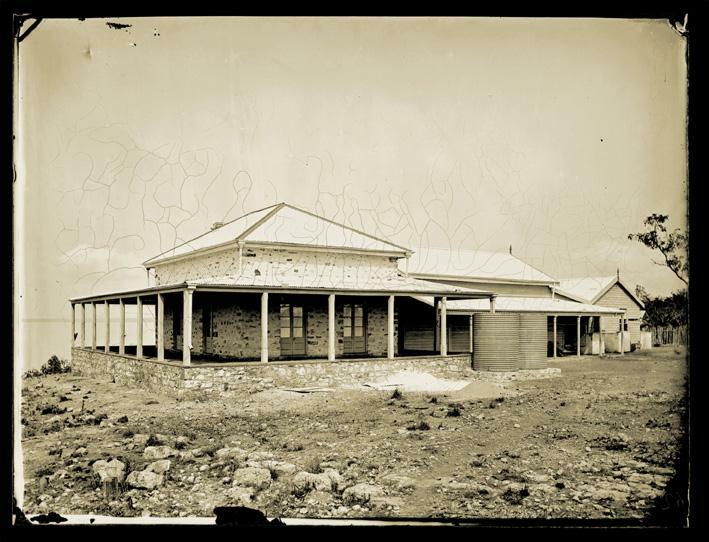 Miss Louisa Da Costa has bequeathed all her real estate in Adelaide to Sir Fowell Buxton the Governor of South Australia to establish a Samaritan fund for convalescents in connection with the Adelaide hospital. -In 1899,^3 cases; 1900, 306 cases; 1901, 380 cases; 1902,373 cases;.in all 1,152 cases, at a cost of £508 5/6. The secretary reported that all rents from property had been paid to date, and the balance in hand was £399 18/1. The property that was referred to in this extract from The Advertiser was the Aurora Hotel in Hindmarsh Square which remained in the DaCosta Samaritan Fund until it was sold in 1983. This hotel was subsequently demolished and offices were built on this site building. In 1953 The Trustees of DaCosta Samaritan Fund Trust were incorporated by Act of Parliament, whilst in 1967 the DaCosta Samaritan Fund (Incorporation of Trustees) Act was amended allowing the Trust to extend its operations beyond the Royal Adelaide Hospital to other Public Hospitals to be declared by Proclamation. More recently the Health Act was changed in July 2008 and now benefits are available for patients from all, SA Public Hospitals. In the last 5 years her legacy has provided over $1.4m in assisting Public Patients here in South Australia.